The POS or Point-of-Sales system of your business is the lifeline of your operations. The best POS system should be easy to use and efficient enough to do more than just processing sales and accepting payments. It should have some additional time and cost saving features such as inventory management, marketing tools, staff management, task automation, reporting, customer data gathering and other facilities that makes it easier to run and grow your business. But choosing a good POS system for your business can quickly become overwhelming. So we have prepared a list of 10 best Point of sale Software to help you find the right POS for your business. 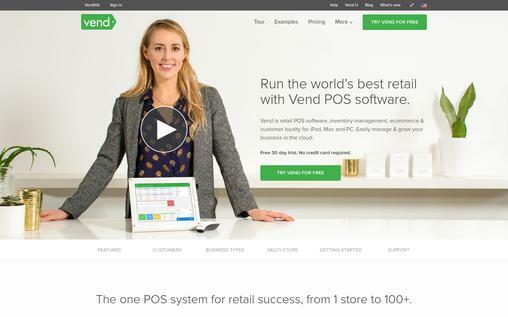 Vend is one of the best all-in-one POS system which is packed with features to help small businesses grow. Other than processing transactions, Vend provides a lot of tools to manage your business, boost sales and more. This cloud-based software works with iPad, Mac and Pc and it can be connected with other POS equipment like printers, barcode scanner and credit card readers. It lets you to accept credit cards and it works with credit card processing vendors, including PayPal, Stripe and Shopify. Vend eCommerce allows you to create an online store in minutes and manage everything centrally. The inventory management tools help you to automate all types of tasks such as low-stock alerts, product counts and reordering. You can easily manage the products and do things like add, edit and remove products. It offers marketing tools that includes a loyalty program to reward your customers and the CRM feature automatically create and organize your customer lists. It integrates with third-party software such as QuickBooks, Xero, Shopify and many more. It offers 24/7 live customer support. The pricing plan starts with $69 per month. 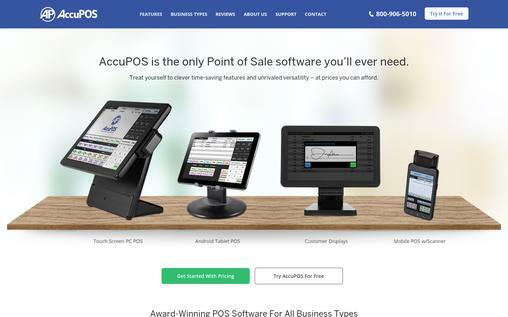 AccuPOS is an award winning POS software that is simple to use and requires minimal training. It integrates with multiple accounting systems and provides software solutions for all type of business including retails, restaurants, counter service and more. It is one of the few software that can manage the complex work of grocers such as charge by weight and multi-line barcode scanning. It offers a POS software for android phones and tablets. It integrates with accounting software such as QuickBooks and Sage. It provides android software for credit card processing and tableside order entry. It offers EMV card readers for reading new chip cards. With its android app and a card reader, even wait staff can process payments tableside. You can use your own hardware or get offers on hardware devices including touch screen POS terminal, cash drawers, receipt printers, customer facing display and more. You can get 24/7 expert support. 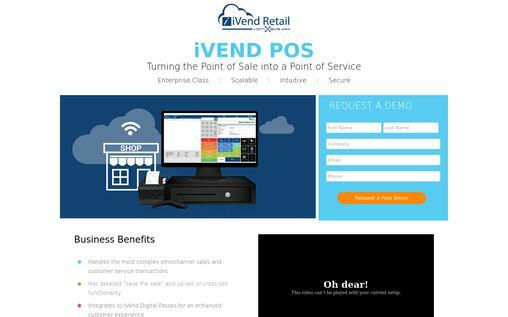 iVend is one the best end-to-end retail POS management that handles the most complex omnichannel sales and covers everything from POS to head office operations. Whether you want to begin mobile processing, replace your basic stationary POS system or sell from an eCommerce store, iVent supports it all. It integrates with various software platforms for improved storage and data sharing, it can improve your customers shopping experience. It provides mobile software for using on tablets and smartphones. You can buy an eCommerce website for online selling, and iVend offers automatic data synchronization with your inventory for accuracy. The mobility application allows you to make sales anywhere; it can be in your store or your customer’s house for delivery services. It integrates with a various applications such as SAP ERP and SAP Business One for easy data management of your store. It works with a variety of applications through the use of API. You system can seamlessly work with platforms like Sage, Oracle, Microsoft Dynamics, SugarCRM, NetSuite and PeopleSoft. CenterEdge Advantage is powerful POS tool for facility management primarily designed for the entertainment industry. It offers a variety of features, including online sales, ticketing, Point of Sale, membership, loyalty, reward programs, group and birthday reservations and much more putting facility-wide management at your fingertips. Sell retails items, tickets and concessions with one system. Barcode/Ticket scanning system allows you to sell admission passes, tickets, retail items and packages in-store and online. 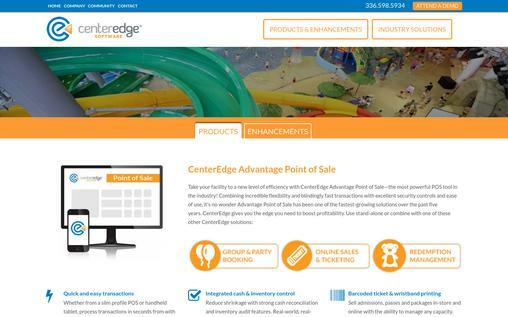 CenterEdge Advantage integrates directly with your local application for online sales and ticketing to drive more customers and increase your revenue. The Advantage Redemption system makes your transaction lightening fast and manages your inventory as well. Integrated credit cards and gift cards speed up your cash transactions. And also supports POS devices. The customer loyalty module helps you to collect customer information, export emails in bulk and reward customers based on their spending or visit histories. It integrates with QuickBooks to easily export accounting data. 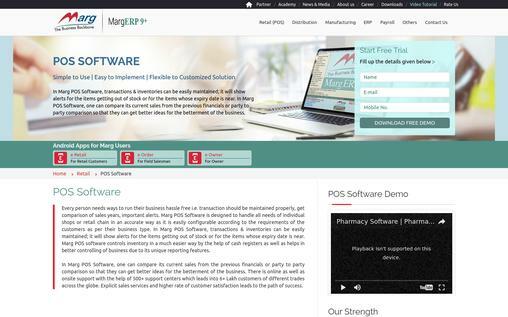 Marg POS is designed to handle the needs of all individual shops as well as retail chain, distributors and manufacturers in an easy and accurate way. It is an advanced and flexible software that can be customized easily. The retail POS module includes Touch POS, inventory management, barcode scanners, reporting, and integration with e-commerce and logistics platforms. Advanced purchase, sales and order management. It provides fast and easy billing solutions including negative stock billing facility, split billing, multi rate, import/export of bill and more. It offers Multi-Currency, multiple godown, multi unit and multiple financial years facility. You can easily manage transactions and inventories and also get alert for items getting out of stock or whose expiry date is near. SMS integration to send bulk email and ability to send Email. There are different android apps for store owners, customers and suppliers. Strong backup facility so there is no loss of data. It costs you a one-time fee of $5000. 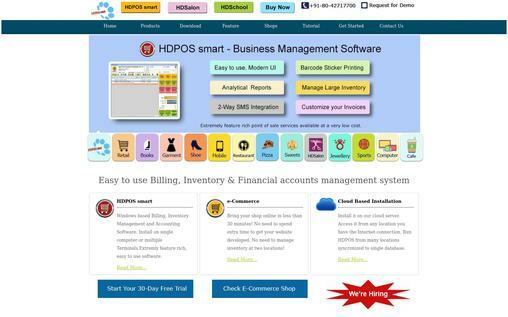 HDPOS is an extremely feature rich and easy to use Point-of-Sales billing, inventory and financial management software for small and medium sized retail businesses. Whether you run a clothing store, book store, retail outlet, restaurant, beauty salon or any other similar business, HDPOS Smart is the perfect choice. Through this software, you can have full control on your business even if you are not physically present in shop. Manage stock, billing, discounts and financial accounting. HDPOS smart offers cloud based installation to access it from anywhere. It is windows compatible and can be installed on single computer or multiple terminals. It offers an eCommerce website to users who want to bring their shop online. You can print invoices in many different formats. It can manage multiple books of accounts for users with more than one company or location. You can create unlimited number of customized report. You can design your own barcode stickers and print them on your simple laser printer. The easy UI and UX design makes sure that the users can intuitively reach the goal on interacting with the software. Create a portrait of your customers through customer profiling for knowing your customers better and generate loyalty amongst them. KOT (Kitchen Order Ticket/Ticket) app simplifies the process of order placing and increases the efficiency of you staff for better customer experience. Role based access control to selectively grant and restrict access to your workforce. The Cashbook accounting feature keeps track of every single transaction for accurate accounting. And it can be used by non-accountants also. Reservations and Waiting App creates a virtual map of all the tables and helps you to know the current status of any table. This is helpful to track the waiting guests’ statistics. 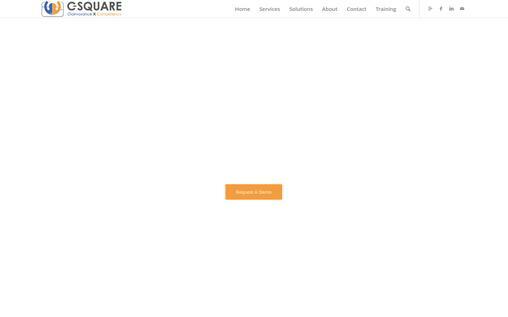 It integrates with leading online ordering providers to directly add online orders to the POS of your outlet. The report feature allows you to create more than 50 different reports. EcoGreen is a retail business chain based management software to efficiently manage customers and process prescriptions in a timely manner. It is suitable for both multi-store and single store owners. In addition to managing your business, it provides insights to help you take better decision. You can manage work flow, adjust stock, and assign user rights from a centralized back office. Inventory management features electronic stock entry, low stock alert, products picture storage, SKU management and bulk upload. It can take care of both the accounting and inventory data from branch to admin office through internet. 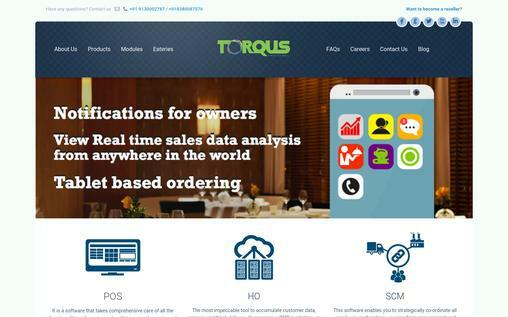 It automatically generates invoice from sales order. It facilitates Cheque Printing and Reconciliation. Provides you rack details and storage details. It offers customer pattern capturing and customer data capturing. It costs a one-time fee of $7,307.00/user. Copper POS is a web-based software to streamline the retails checkout process for your customers and employees. It provides businesses with a cash register system. With this software you can easily record cash transactions, manage product pricing and discounts and print receipts for your customer. It records all your sales transactions quickly and easily. It helps you to Generate and print professional looking receipts. Works well with barcode scanners and touch screen terminals to eliminate the need for keyboard or mouse input. It supports multiple payment methods such as credit cards, cash and checks. Also it supports multiple payment types. Easily apply promotions and store coupons to your entire purchase or individual items. It Integrates with Inventoria to manage inventory. Manages offered discounts and item pricing. It supports all the receipt printers and you can print either on a regular page or on receipt roll paper. You can process refunds and take a print of updated receipts in a few steps. It offers data backup and restore feature to keep your data safe. 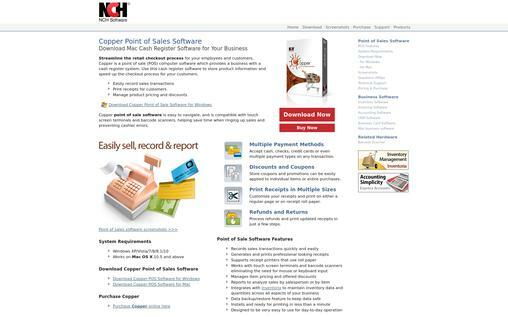 Provides you reports to analyze sales by items or by salesperson. 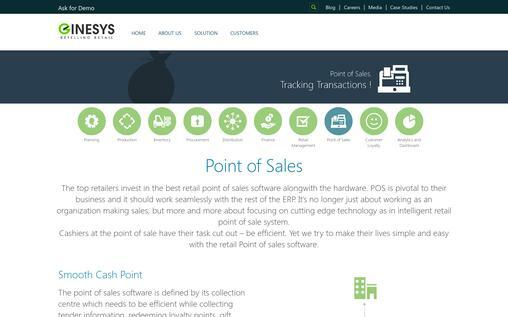 Ginesys POS retail software covers the whole multi-channel retail management from procurement of inventory to POS. It includes sales and distribution, production, customer loyalty and accounting. Helps you to efficiently apply for discounts and promotions, redeem customers’ loyalty points, gift coupon codes or vouchers. It automatically updates the stock and sale of the back office of POS to the retail EPR running at head office. In case of franchise store, it controls stock without affecting the accounts. It supports credit card processing for payments. You can directly scan bar codes or search by product attributes. It takes auto backup of your full or incremental data. It supports roll based access and multi user login. It is available for purchase at a one-time fee of $10000. The Point of Sales software not only helps you to make a sale but the cutting-edge technology helps you to manage inventory, track sales, empower staff and manage customers. Each software has different offerings, so choose one that provides dedicated solutions for your type of business.